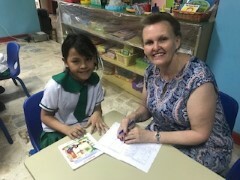 Mrs Murray and I have returned from a fabulous experience in The Philippines last week. 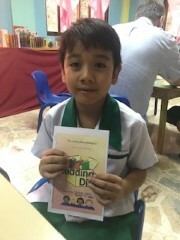 The Philippines is a most diverse and beautiful place to visit but our favourite time was visiting the City Gate Academy School, volunteering our time to support the daily reading program. We were also extremely privileged to be invited to visit one of the students’ homes. This was a very heart wrenching experience, where we witnessed first hand, the extreme poverty and harsh conditions these families were living in. 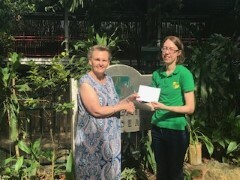 It helps put in perspective the great need to continue to support the missionary work of churches and other volunteer organisations who provide support for the needy. We will share some of our experiences with the students and staff during the next few weeks. 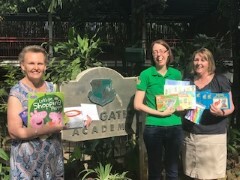 The Principal, Lyn, of City Gate Academy School, asked Mrs Murray and I to pass on their very grateful thanks to all those who were able to send school supplies and or donate money towards the school. It was wonderful to be able to deliver these items first-hand to the school and know that they would be utilised. Lyn also told us that they would forward photos of the items they purchased using the money that was donated. Thank you to everyone for their generosity. A special thank you to Mrs Richards for keeping everything running smoothly while I was on leave last week. It was wonderful to keep track of the great happenings at St Mary’s via the Face Book page. I am sure everyone enjoyed the fantastic experience of the author visit and honouring the 100th Anniversary of Armistice Day. This week Years 2-6 will have the wonderful opportunity to experience a Cricket Program on Wednesday. Our 2019 Kindergarten Orientation program continues on Thursday and our final golf lesson on Friday. 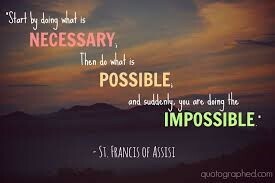 Wishing everyone a very happy week ahead. 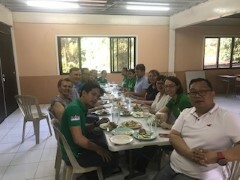 A few photos of our trip to the Philippines. Presenting our donations to the Principal. Edie for insightful contributions to class discussions. Sarah for working hard to finish her writing and spelling in each lesson. Jacob for displaying excellent collaboration skills when solving maths problems. Ryley for mature responses during our health topic discussions. Star for enthusiasm and beautiful display of reverence in religion. Thomas for his enthusiasm and effort in our golf lessons. Annabelle for her enthusiasm towards all subjects, particularly geography, history and science. Catriona for reading with fluency and accuracy. 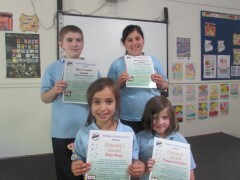 Isabelle for writing a detailed report. Oscar and Jiemin for speed and accuracy in maths mentals. Sebastian B, Demianna, Elise, Harry & Payton. This week the Foster family will be on cake raffle. Tickets are sold for 20c each on Friday. Our home cooks this week are the Jackson & Shang families. Cooking is sold for 50c per piece on Friday. We wish Liam P a happy 11th birthday today! We hope you have had a great day Liam. Our radio presenters next Tuesday 20th November will be Lucy & Oscar. Tune in at 1.45pm to hear what is happening at St Mary's. As of the end of November St Mary's will no longer be using the skoolbag app. All our informaion, alerts, absentee notes, uniform orders and newsletters will now be available on the new SZapp. Please ensure you have downloaded this app. Don't forget to check out our new updated websiite as well! 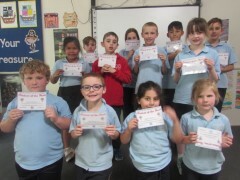 Summer sizzlers were held today. Next Wednesday 21st November will be "Homemade Chicken Nuggets & Wedges". Orders and CORRECT money need to be in to the office by 9am. Tomorrow years 2-6 will be attending a "Cricket Blast Cup" at the Batlow Oval from 9-15am -2.30pm. 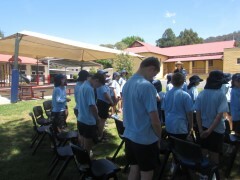 Yesterday staff and students held a whole school ceremony to commemorate and remember those who fought and died for us. 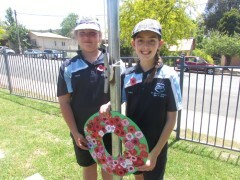 "Lest We Forget"
Thank you to John and Jack Wilkinson for cleaning out all the school building gutters on the weekend. Your donation of time is appreciated. Mel our school counsellor will be here this Thursday 15th November. Please phone the office if you would like to speak to Mel or make an appointment for your child. This Thursday and next will be the final two orientation days for our 2019 kindergarten students. These will be FULL days from 8.45-3pm. This SUNDAY 8.30am. Please let the office or Mrs Richards know if your child/children are coming along so they can be given a job. Helpers are needed this THURSDAY 9am-3pm in front of IGA and 6-8pm on FRIDAY night at the RSL Club foyer. Thank you to Leah Hamilton who has offered some time on Thursday. Please let Tracee know if you can help. Kris Kringle will go ahead this year! Thank you to all the parents who responded to the recent survey. Kris Kringle, or Secret Santa as some people call it, is a much loved tradition at St Mary's Batlow as your comments demonstrated. The Australian Guide to Healthy Eating will help you to choose a wide variety of nutritious foods every day. 2018 Awards Afternoon - Monday 17th December 2pm. BTS will be holding a disco on Thursday 15th November. Students are to be dropped off and picked up promptly please.